The urban geography of Milan is the one from a radial city that has been growing like an oil spot with different concentric rings. The project is focused on the south area, an agroforestry mosaic and fields. To REinvent the city, or at least a portion of it, one must search its origins, which are, in this case: water and nature. During the Middle Ages, Milan was a compact city that grew gradually outside the walls in an organic way and measured by the need for city expansion and conquest. Our place is a limit, a vague limit in the city, located between what is built (the urban) and the countryside (the agroforestry park). This vague boundary is the casual and non-planned result of the city, RENATUR finds its opportunity here: we want to re-naturalize the city and get a limit that is not a physical, tacit, social, ecological wall, but an open and permeable boundary for a sustainable and smart future. The project is an open door between the park and the city and towards the agricultural landscape. The proposed strategy is: this greens wedges are useful to RE-NATURalize the city and prevent the built stain or spot from keeping invading the city. The design has been given particular attention to the ecological and sustainable aspect (closed cycles for energy, heat and water). In terms of energy the greenhouses are using a heat pump. This heater is connect to the windmills and the biomass energetic station existing. We would like to make use of the heat pump for winter heating and summer cooling. We chose to use wind energy as clean energy (100%) being a complement to the PV needs to disposal once exhausted its use. Milan is a geographical area with low wind speed and it is ideal for small wind turbines. We apply the ecological system of the project reuse and recycling of water (water close cycle). We propose that each building is provided with filter for domestic water reuse and rain water is used for the irrigation of the urban gardens (closed ecological cycle). The main protagonist will be the landscape and not the buildings. The landscape should not be static, but a dynamic and changing landscape over time. 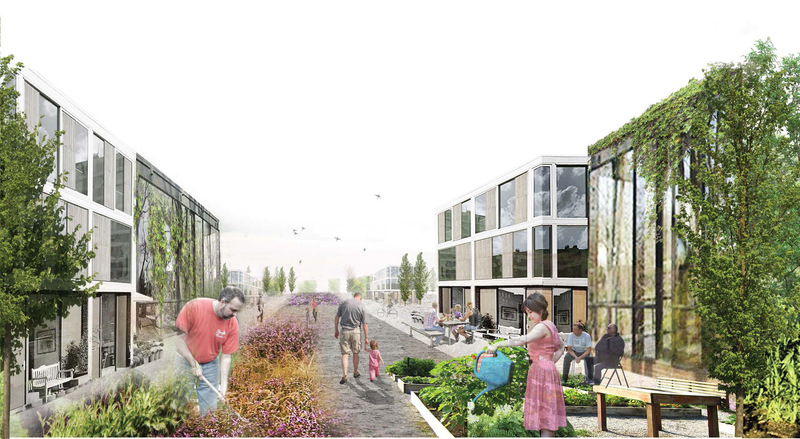 This landscape can absorb different situations: sport uses, outdoors ludic spaces, residential, urban gardens, vegetable patches, stores and public space. We do not want to imitate neither the nature nor the city. It is a weave of black poplars (Populus nigra Italica, very usual in the Lombardy) suitable for the intensive cultivation. It is a domesticated nature that gives quality to the project area. These trees are very productive and biodiesel and biomass can be obtained. Energy, economic and environmental profit can be obtained (closed cycles of sustainability). Third Award | RTFA 2014 Awards.